Soft Pull, Hard Pull, Bring It On! After the previous post about joining Navy Federal Credit Union, reader John asked whether there was a hard pull. Similar questions came up before on opening accounts at other banks and credit unions. My answer was I didn’t know. A hard pull refers to a type of inquiry to your credit report that’s supposed to be more serious. A potential lender makes a hard pull to evaluate whether to give you credit. Another type of inquiry is a soft pull. A soft pull is not associated with granting new credit. It can be used by an existing lender to keep tabs on your credit situation. When you open a bank account, because you can potentially overdraft and owe the bank the shortfall, the bank wants to know how good your credit is. If you have bad credit, the bank can reject you. That’s why some banks or credit unions do a hard pull when you open a checking account. Some places don’t do it if you only open a savings account or a CD. Some institutions do it no matter what type of accounts you open. A hard pull supposedly has a slightly negative impact on your credit score, whereas a soft pull does not. That’s why some people care about whether they are going to get a hard pull. There’s nothing wrong with caring about a hard pull versus a soft pull versus no pull. I just never cared and I still have good credit scores. Up to a few years ago you had to pay if you wanted to see your FICO score. 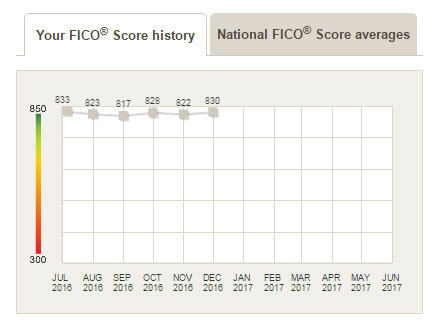 Now you can see your FICO scores updated monthly if you have an account with certain banks or credit card companies. Discover only asks you to register if you don’t have an account with them. I rarely check but I know where to find them. I looked at my FICO score history through American Express, Bank of America, and Barclaycard. A FICO score is calculated off the information in a credit report using a set of algorithms. Depending on which credit bureau’s report was used and when the score was calculated, the scores were slightly different. The numbers in the first chart are between 816 and 835. Give-or-take a few points, all three charts show the same range of scores. During this time I opened and closed accounts whenever and wherever I wanted, with no regard to whether there was going to be a hard pull or not. Was the dip in September 2016 caused by a hard pull? I don’t know. Did it really matter? I doubt it. I’m going to continue living my life the way I want, not caring whether it’s going to cause a hard pull or a soft pull. 740 is a common FICO score cutoff for getting the best rates on loans. If your FICO score is right around there and you are trying to get a loan, you don’t want a hard pull to knock you below the cutoff. If you are well above the cutoff and you are not trying to get a loan, just don’t worry about it. See also: A High Credit Score Is Not Necessary for the Best Loan Rate. 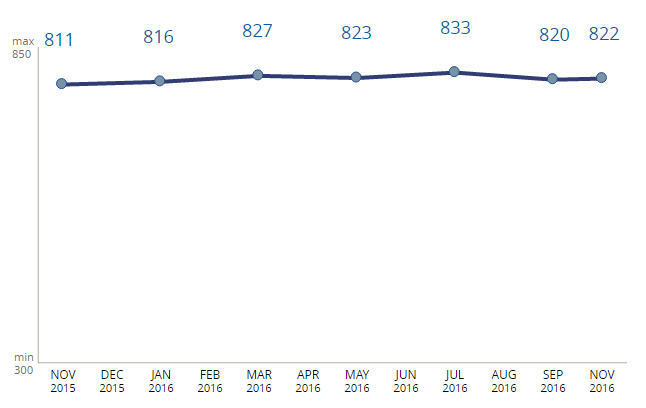 My credit took a hit when we bought a house. Everyone and their mother wants to check your credit before handing you the keys. I think total I lost something like 10 – 15 points. I know it’s not a big deal in the long run (it’s since shot up again), but it’s pretty stressful watching it fluctuate in the meantime. It’s true that lots of hard pulls will negatively affect your credit, so think carefully when opening new credit cards, accounts, etc. If you have excellent credit it shouldn’t matter too much, but for someone on the cusp it could be incredibly important to consider. 10-15 points is not a hit. That’s just normal fluctuation. Worry about it only when you are trying to get a loan and only when you are near the borderline. Your credit score is excellent, Harry. As the linked post at the end showed, it didn’t matter even when I had C-grade scores. Credit Karma offers free credit score (from 2 bureau only) but best of all it shows why the score changed. It will also show you hard/soft pulls. The number of hard pulls in a certain period matters more than the one hard pull. I did not see a hard pull from Navy Credit Union, but I do have a freeze in place and they did request for more information to identify me. A hard pull can be important if you play the credit card opening bonus game like I do. According to the credit reports I get dinged somewhat because I have opened a lot of accounts. But my score is still in the high 700s since I always pay my bills on time and have a good income I almost always get approved. The dreaded Chase 5/24 rule impacts me more than my score.